The United States has filed 23 charges against Huawei Technologies, contending that the Chinese company had stolen trade secrets from a telecoms rival and violated U.S. sanctions against doing business with Iran. Included in the criminal indictments were Huawei, the largest Chinese smartphone maker; its U.S. affiliate, Hong Kong-based Skycom; and Meng Wanzhou, Huawei’s Chief Financial Officer (CFO), for conspiracy that poses a national security threat to the U.S. The U.S. also requested Canada to extradite Meng, who is free on bail in Vancouver pending extradition proceedings. A federal grand jury in Brooklyn, New York, charged Huawei – and Meng – with money laundering, bank fraud, wire fraud and conspiracy. Huawei was also charged with conspiracy to obstruct justice. A separate indictment from Washington State accuses Huawei, its U.S. affiliate, Skycom and Meng, of stealing trade secrets from the telecommunications company T-Mobile. The charges stemmed from a civil lawsuit filed by T-Mobile in 2014 over a robot, “Tappy”, which was used in testing smartphones. “Huawei has misrepresented itself over the years,” Whitaker said at a news conference that included U.S. Commerce Secretary Wilbur Ross, Department of Homeland Security Secretary Kirstjen Nielsen, and FBI Director Christopher Wray. “Criminals and bad actors can be certain that they are not going to get away,” Whitaker said. “We show it today and we will show it as the case moves forward.” Secretary Nielsen said that Huawei’s behavior wasn’t “just illegal but also detrimental to the national security of the U.S.”. FBI Director Wray added that Huawei has repeatedly refused to respect U.S. law. The charges could complicate trade talks between the U.S. and China to end the imposition of tariffs on each others’ imports. The Chinese government denounced the charges as politically motivated and immoral. “The United States has been using state power to smear and attack specific Chinese enterprises, destroying the legitimate operations of the companies,” Chinese Foreign Ministry Spokesman Geng Shuang said. “There is strong political motivation and manipulation behind it. China is determined to protect the legitimate rights of Chinese companies,” he added. Huawei denied “that it or its subsidiary or affiliate have committed any of the asserted violations of U.S. law set forth in each of the indictments, is not aware of any wrongdoing by Ms Meng and believes the U.S. courts will ultimately reach the same conclusion.” Meng’s lawyer Reid Weingarten, Partner at Steptoe & Johnson, said Meng “should not be a hostage” in China-U.S. relations. “Our client, Sabrina Meng, should not be a pawn or a hostage in this relationship. Ms Meng is an ethical and honorable businesswoman who has never spent a second of her life plotting to violate any U.S. law, including the Iranian sanctions,” he added. As Huawei is coming under suspicion abroad, where several governments have either banned or are reviewing whether to allow Huawei equipment for their telecoms networks, China has pledged to fast-track the issuance of 5G commercial licenses as part of an effort to boost the domestic use of the next-generation mobile technology. China’s National Development and Reform Commission (NDRC) said that it will speed up the granting of 5G commercial licenses to upgrade so-called information consumption in the country. The central government already awarded China Mobile, China Unicom and China Telecom with 5G spectrum licenses at the end of 2018, enabling them to conduct final trials for the new mobile system before its wider commercial roll-out set for 2020. The 5G networks are ready for “pre-commercialization” after the completion of the latest tests. 5G devices are expected to become available by mid-2019. 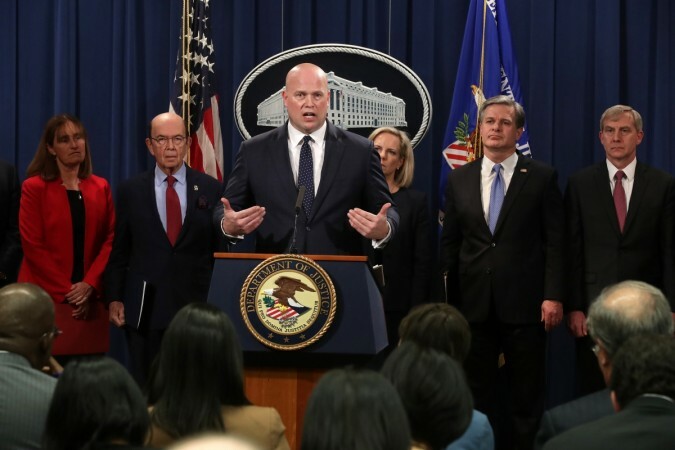 Analysts warn that the U.S. indictments against Huawei Technologies could potentially create two distinct camps in the telecommunications industry. If Huawei is blocked from providing network equipment to the U.S. and its allies, Western companies and Asian firms would only be allowed to serve their own markets. Belgian telecom operators see no reason to ban Huawei equipment from their networks, although the Center for Cybersecurity has launched an investigation into possible security risks of using the equipment. Proximus says it has a good relationship with Huawei and is a long-time customer. Orange Belgium has been working with Huawei for many years and is not worried. It has not yet chosen 5G suppliers, while Telenet is using a limited number of Huawei equipment, according to the newspaper De Tijd.